Obesity in childhood is increasingly becoming a significant global public health burden . Several studies have documented that higher childhood body mass index (BMI), an established measure of obesity, is associated with increased risk of adverse cardiometabolic outcomes in adulthood such as type 2 diabetes, hypertension, dyslipidemia, coronary artery disease, and markers of cardiovascular diseases [2–13]. Identifying common biological pathways underlying childhood adiposity and adult diseases will help unravel mechanisms linking childhood BMI and adult cardiometabolic diseases. It will also provide insights that will help distinguish adiposity-related biological processes that operate in childhood from those that operate in adulthood and to formulate possible causal relationships. Recent evidence for strong genetic correlations between childhood BMI and a few adulthood cardiometabolic traits such as BMI [14, 15] hint the possible role of genetic pleiotropy, a phenomenon in which a genetic variant(s) influence two or more traits [16–18]. Moreover, single nucleotide polymorphisms (SNPs) associated with adulthood BMI exert their influence on adiposity during childhood [15, 19–21]. Twelve out of 15 SNPs associated with childhood BMI at a genome-wide level of significance are also associated with BMI in adults . Further interrogation of the National Human Genome Research Institute-EBI (NHGRI-EBI) genome-wide association study (GWAS) catalog  reveals that some childhood BMI loci are associated with other measures of adulthood adiposity such as hip circumference, waist circumference, body fat distribution, and fat body mass, energy intake, and type 2 diabetes (ADCY3, ZNF646P1, MC4R, GPR61, BRINP2, FTO) [23–27]. These observations highlight the roles of shared genetic effects; however, to date, the extent of genetic pleiotropy between childhood BMI and a wide range of adult cardiometabolic diseases has not been investigated. Although no genome-wide evaluation of genetic pleiotropy in childhood BMI and a range of adult traits has been done, cross-trait evaluation of individual GWAS loci and genetic risk scores derived from the loci presented in this study have been evaluated in relation to childhood and adulthood BMI. These studies have found that adult BMI loci also operate during childhood [20, 29–33]. Out of the 97 known adult BMI SNPs discovered in a more recent large-scale GWAS, 86 SNPs had directionally similar effect on childhood BMI and 50 were nominally associated with childhood BMI . The two most recent childhood BMI GWAS studies have reported that seven out of eight loci , and 12 out of 15 loci associated with childhood BMI , are also associated with BMI in adults. Meanwhile, a strong genetic correlation between childhood BMI and adult BMI has been observed (ρ = 0.73) . A few other studies have also reported genetic loci that overlap in their associations with childhood BMI or obesity, adult type 2 diabetes (FTO, ID-HHEX) [26, 35], bone mineral density (SP7) , waist circumference (TNKS-MSRA) , and triglyceride levels (TNKS-MSRA) . Our study found several SNPs that overlapped in their associations with childhood BMI and adult adiposity traits, type 2 diabetes, coronary artery disease, and HDL cholesterol. Notably, the overwhelming majority of childhood BMI genetic loci continue to exert influence on adult BMI. Therefore, genetic factors may partly explain the widely known observation that childhood BMI tracks through adulthood . Our finding also strengthens previous observations of substantial overlaps in the genetic architecture of childhood and adulthood obesity [20, 29–33]. Furthermore, we found that the genetic architecture of childhood BMI is mirrored to a large extent by adult waist circumference (61.54% overlapping SNPs associated with childhood BMI) and BMI (47.25% overlapping SNPs) but to a lesser extent by waist-to-hip ratio (26.32% overlapping SNPs). Similarly, previous studies have shown that a higher adult BMI genetic risk score [19, 20], but not a higher waist-to-hip ratio genetic risks score , is associated with higher childhood BMI. Future studies interrogating the influence of adult waist circumference genetic loci on childhood adiposity will have the potential to provide new insights into mechanistic underpinnings of the early origins of total body and visceral adiposity. The association of rs12446632 (near GPRC5B) with childhood BMI-adult HDL cholesterol in our study is noteworthy. A previous GWAS has already reported its association with childhood BMI . 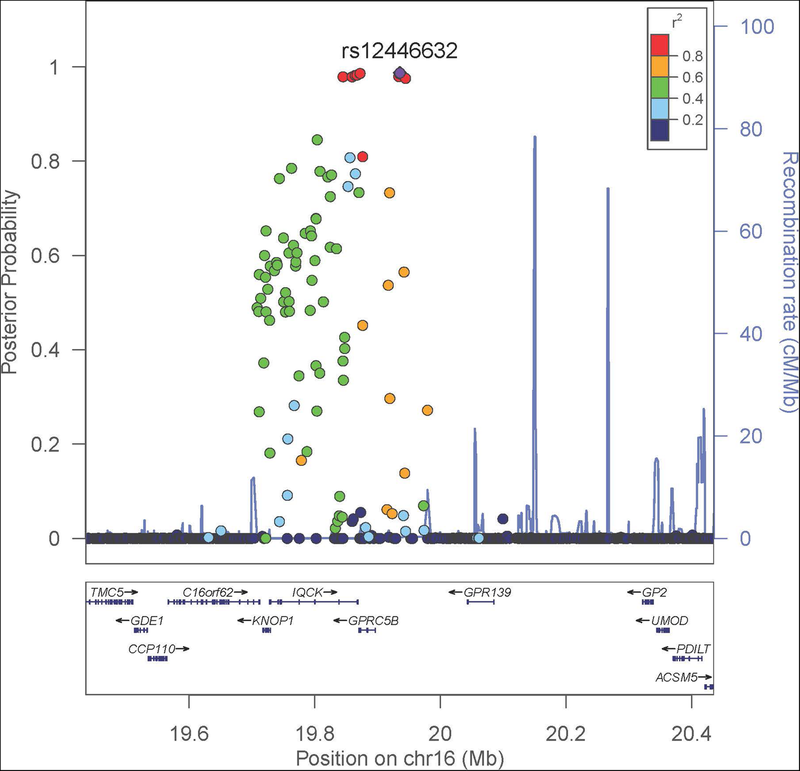 The novelty of our finding is the association of rs12446632 with adult HDL cholesterol; the SNP or its proxies (in strong linkage-disequilibrium) fell short of genome-wide significance in previous GWAS of HDL cholesterol . The allele associated with increased childhood BMI was also associated with lower HDL cholesterol, consistent with observational studies that found inverse correlations between childhood BMI and adult HDL cholesterol levels [4, 40]. SNP rs12446632 may have important functional roles given its proximity (39 kbp) to the 5′ of GPRC5B, its relatively high CADD deleteriousness score, and evidence of roles in regulating expression of GPRC5B, and overlapping histone marks. GPRC5B is highly expressed in adipose tissue and the central nervous system . The encoded protein is a lipid raft-associated transmembrane protein that may be critical for inflammatory signaling in adipose tissue [41, 42] and modulates insulin secretion . We also observed that rs12446632 was associated with adulthood adiposity measures consistent with previous GWAS that reported significant associations of the SNP with adulthood BMI [21, 44, 45], obesity , waist circumference , and hip circumference . Given the known association of adulthood BMI with dyslipidemia  and this widely replicated association of the SNP with obesity [21, 23, 44–46], it will be noteworthy to investigate whether the rs12446632-adult HDL cholesterol association found in our study is mediated through BMI during adulthood. We assembled GWAS summary statistics data including P values and effect directions of genome-wide SNPs reported by six consortia [21, 23, 28, 51–57], involving childhood BMI and 15 adult traits (BMI, waist-to-hip ratio, waist circumference, type 2 diabetes, fasting plasma glucose, fasting plasma insulin, glycated hemoglobin, insulin secretion, insulin sensitivity, coronary artery disease, myocardial infarction, LDL cholesterol, HDL cholesterol, total cholesterol, and triglycerides). The majority of the study participants had European ancestry, with some studies additionally involving individuals of East Asian, South Asian, and Hispanic- and African-Americans (Additional file 1: File S1). The samples met the consent criteria established by the projects that participated in the six consortia that assembled the genotypes [21, 23, 28, 51–57]. The NIH Office of Human Subjects Research Program granted the study an exemption from IRB review (OHSRP ID Number: 18-NICHD-00412) per 45 CFR 46 and NIH policy for the use of specimens/data.